Dictated by seasonal vagaries in rain and sunshine, wildflower blooms arrive suddenly and leave just as quickly. Often, they last for only a few weeks—but during their brief blaze of glory, these carpets of color provide an insight into the extent of nature’s beauty. They delight those that witness them, and are made more special still by their innately ephemeral nature. 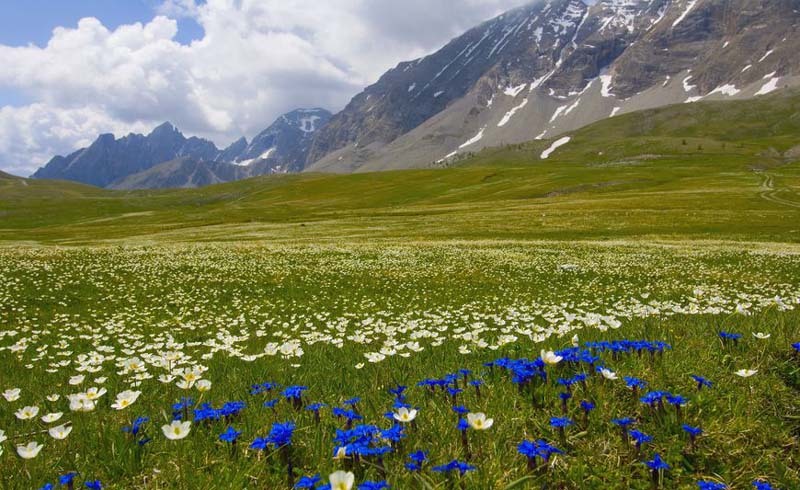 In this article, we take a look at some of the world’s most beautiful wildflower destinations. Be aware that wildflower blooms are difficult to predict, as they depend upon the arrival of annual rains. Nothing is set in stone, and some years are better than others. To avoid disappointment, make sure to check with local sources before planning a trip to any of these destinations. 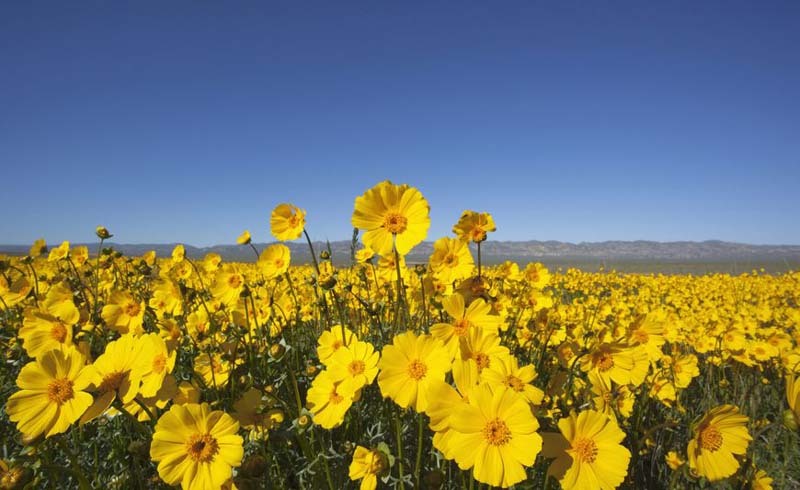 The internet is currently filled with images of the super bloom occurring at Carrizo Plain National Monument, a remote wilderness located halfway between Bakersfield and San Luis Obispo, California, in the United States. After a long drought, the rains finally returned to California this winter—and as a result annual flower species that lay dormant in the desert have suddenly bloomed, creating a carpet of brilliant yellows and purples where before there was only barren earth. 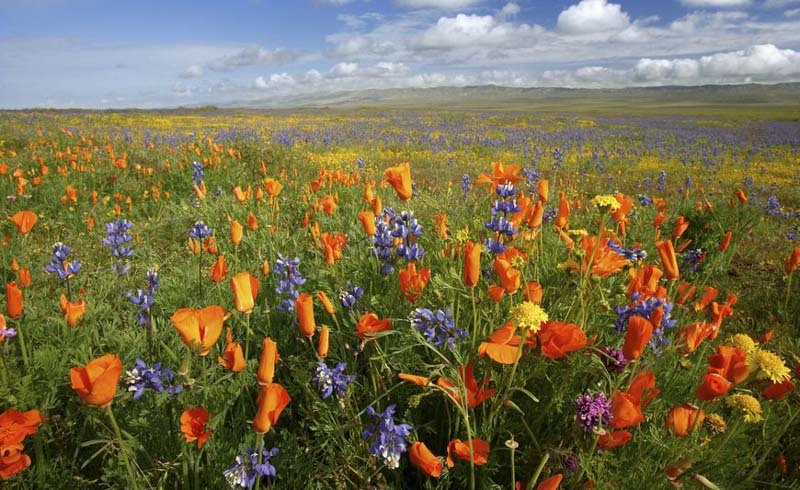 Carrizo Plain is not the only place to be transformed by California’s annual wildflower blooms. From February to mid-March, Anza-Borrego Desert State Park plays host to hundreds of desert lilies, desert sunflowers and sand verbena. 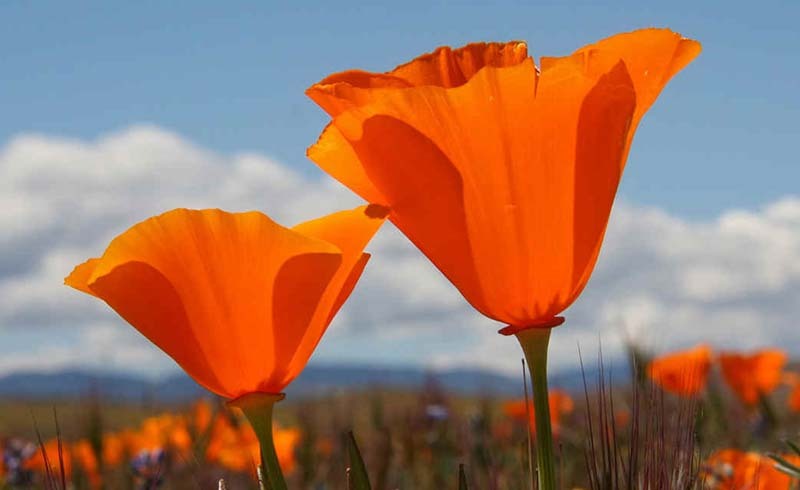 Every spring, the Antelope Valley California Poppy Reserve is brought to life by blooms of orange poppies and purple phacelia. 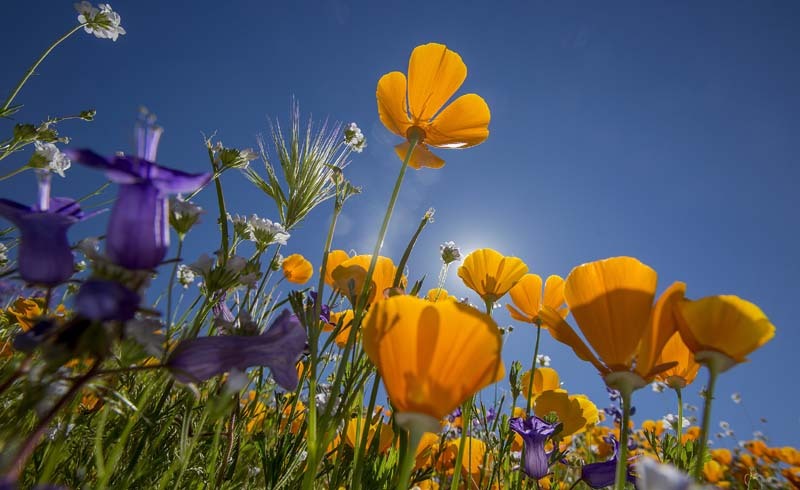 Although each area differs, California’s wildflower season usually lasts from mid-February to early May. For up-to-date information on where to see the best wildflowers, consult the Wildflower Hotline. Situated in South Africa’s Northern Cape province, the arid Namaqualand region is transformed each spring into a flower-filled paradise seemingly overnight. It is one of the most diverse floral hotspots on the planet, with over 3,500 plant species, some 1,000 of which are endemic. Of these, the most iconic is the brilliant orange Namaqualand daisy. There are many different places from which to see the flowers. Join a tour, or explore one of the area’s self-drive routes instead. Highlights include Skilpad Nature Reserve near Kamieskroon, which is known for its abundant Namaqualand daisies. 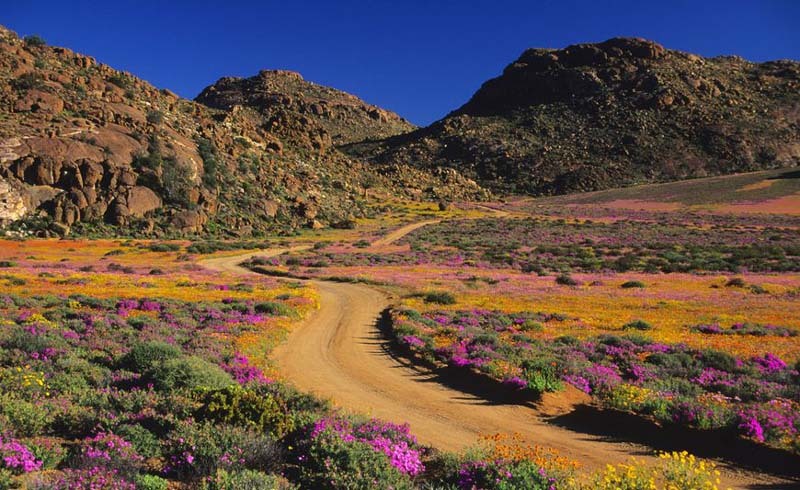 The town of Nieuwoudtville is famous for the diversity of its bulbous plant species, while Goegap Nature Reserve near Springbok is dressed in different flowers every year. Blooms begin in the far north in late July or early August, and move slowly southward towards the West Coast. Their splendor is bright and brief, usually fading by mid-September. Mercantour National Park stretches along the Italian border and incorporates the most southerly section of the French Alps. It is a stunning tapestry of snow-capped peaks and crystalline alpine lakes—and in spring and summer, its pastures are blanketed with wildflowers. The park is home to over 2,000 species of plant, 40 of which are only found within its borders. Rare species include the snow-white edelweiss and the endemic Saxifraga florulenta. From late June, the park’s meadows are painted with the purple-pink hues of the delicate martagon lily, while splashes of bright blue gentian add drama to the alpine landscapes. Mercantour National Park is a hiker’s fantasy, with over 370 miles of marked trails. Accommodation is available in the form of scenic campsites and rustic mountain gîtes, and should be booked in advance. Keep an eye out for rare wildlife including the Alpine ibex and the Italian wolf. From June to September, more than 12,000 wildflower species flourish in a cacophony of color across the vast expanse of Western Australia. Of these, 60% are endemic. The season starts in the north with the arrival of the first tropical rains, then moves slowly southwards. 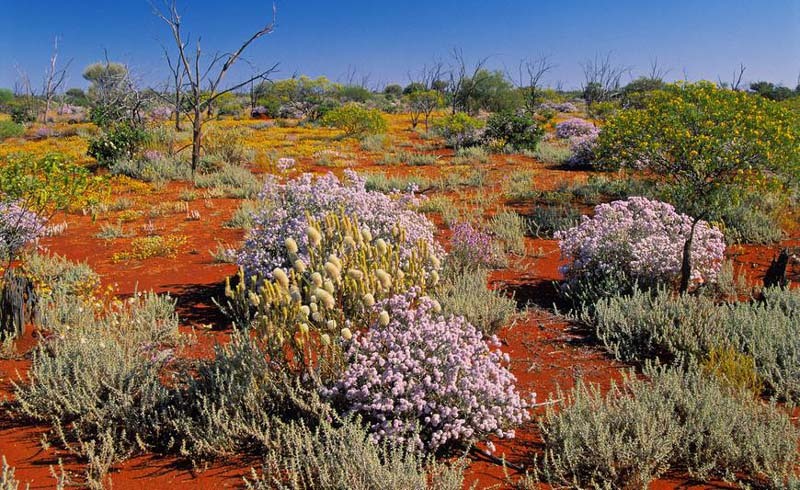 Traditionally, the remote Pilbara region is the first to bloom. Here, pockets of flowers including pink mulla mulla, native roses and hibiscus provide a beautiful contrast to the area’s blazing blue skies and deep red earth. Further south, Coalseam Conservation Park, Lesueur National Park and Kalbarri National Park are all renowned wildflower hotspots. In the far south, Fitzgerald River National Park has earned itself a reputation as one of the most diverse botanical regions on Earth, with approximately 1,800 species of flowering plant. The best way to see as many of the state’s wildflower panoramas as possible is to plan a self-drive adventure along one of these routes. Located a 10-minute drive south of Halle, a city in the Belgian province of Flemish Brabant, the Hallerbos woodland is the most accessible wildflower destination on this list. The forest has many attractions, including giant sequoia trees and springtime explosions of wild daffodils. 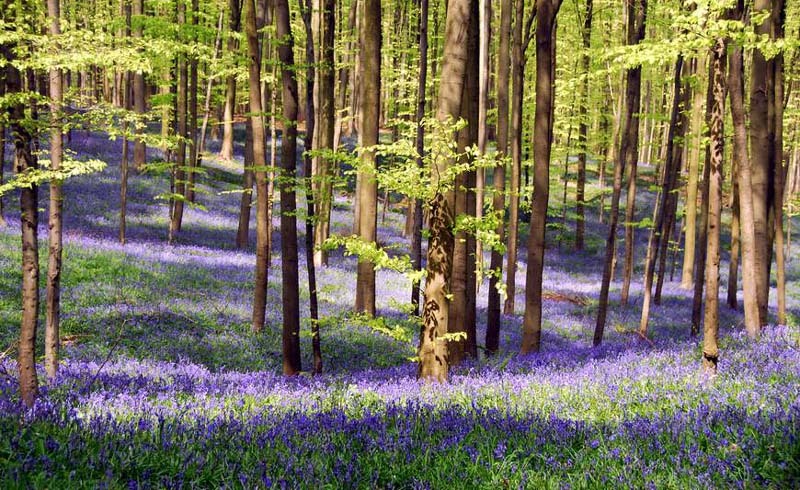 It is most famous for its bluebells, however, which carpet the forest floor for a few short weeks each spring. Typically, the second half of April is the optimum time for bluebell viewing. At this time, the woodland’s beech trees are dressed in new foliage. The bright green leaves contrast beautifully with the bluebell carpet, and allow enough sunlight through to paint the forest in ethereal shades of purple and blue. There are several marked trails, two of which (Achtdreven and Roebuck) pass through the main bluebell area. There’s also a free forest museum, and an abundance of wildlife ranging from badgers to roe deer. These Are the Best Home Decor Boutiques in the U.S.